• Auto coiling wire from an extrusion line or from a pay off rewinding line. • Touch screen (MMI) easily control machine overall movement. 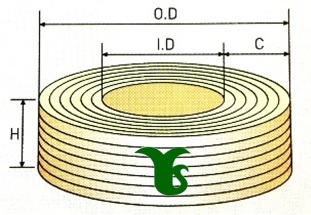 • Standard service range from Coil O.D. 80-800mm. • Best choice to make coils for wire and cable, tube, hose industry, etc. • Simple and easy to use machine, with low maintenance cost. B) The main function of machine includes: length counting, wire feeding to coiling head, wire coiling, cutting wire when the pre-set length is reached, and move the finished coil to the working plate.